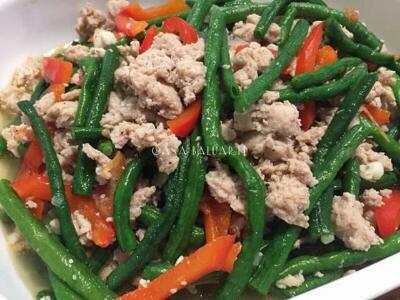 Ginisang Sitaw or Sauteed Beans with Ground Chicken is an easy to prepare healthy meal for the family. Saute ginger, garlic and onions in cooking oil. Add ground turkey, saute till golden brown. Add the water and simmer in medium low heat for few minutes. Add the beans, simmer for few minutes. Add the bell peppers , simmer for few minutes or till vegetables are fully cooked.